Ambergris Divers offers Open Water Divers or Junior Open Water Divers the Adventure Diver Certification to broaden their love for SCUBA. With these specialty adventure dives you will acquire more experience to strengthen your scuba skills and increase your knowledge of the enchanting underwater world. 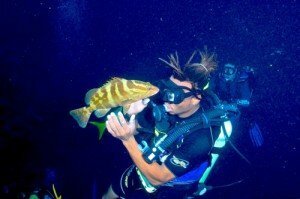 PADI Adventure Divers (at least 15 years of age) can go on to the Advanced Open Water Diver Certification. Tanks, weights, belts, and refreshments included. Full head on board most vessels with onshore rest room facilities available. Complimentary pick up and drop off service from most resorts. Minimal fee may apply for secluded properties. Schedule: 1 half day plus 1 afternoon or 1 night dive. Included: Includes use of dive gear, online certification registration.